For this week’s psychic exercise, I’ve chosen a special photo and I can’t wait to read what you guys get for this week’s psychic exercise. I expect quite varied answers – because there is a lot of energy in this picture. Remember to use your senses when describing the information you received (I saw, I heard, I felt…) to help you be as accurate as possible. If you get a big long story – please disconnect and re-connect. The information will be more likely to come in in parts – not a big long diatribe. Ok, have fun! Post your impressions from this exercise in the comments section below and compare what you received to what others received to see how you did! At first I get an “ahh” feeling but then it shifts to a more “huh” like something is “off” & I saw the word “mud.” There feels like some old, yucky energy around this. I get on the surface it appears refreshing but it seems to contain some more “dirty” energy. I see the word “rust” also. I saw people clearing sadness around this fountain or a connection with sadness to the fountain. Slow energy pulses in my hands, I see the wrods, money & sadness. I saw tan hands laying down the bricks. The name of this site is the Chalice Wells, also known as the Red Well. The red well is red due to the iron content and considered the divine feminine well, (while the White Well next door is the divine masculine and has no iron). This photo was taken while standing on the threshold, a place to release what ever is not serving you. The female energy is so strong here. It was my first impression. The sense of female hands, a shamanic woman. Healing. I see a pretty woman in her 60’s with white hair and a bun. She’s pretty and elegant and is wearing a white flowy dress. There is money involved. I see dancing. A celebration of some sort. I’m getting Ohio. Columbus maybe. I’m also seeing a red fox, and a motor boat. The caretaker is a woman with a white bun in her 60s. There is a admission price to enter this site and there is a gift shop as well. Also while I was there there was a musician playing while people were dancing. If we get a vote (it’s your game so you decide the rules! :) but IF we get a vote, I’d like a chance to see some of your details about the photos after we’ve commented. I get why it can be helpful that you don’t, but on the other hand, speaking for myself, it would be exciting to know that I’ve picked up on something that wasn’t just “noise in my head” and when I do get a hit, the validation helps me to better trust what I DO feel/see/hear. Also, the first few times, after reading your info about the photos, it helped me to realize that I was focusing too much on the visual details of the picture and the mood it created –using “detective” skills rather than an intuition. Regardless of what you choose to do, these exercises are really fun, and I thank you! Before I even looked at the picture I saw a ‘wedding’ in my mind. Connection to mexico? I see corn in sacks. I see someone jogging with a walkman. Lining up for coffee. Pumpkins, Halloween? Then I saw some knitting being unravelled. Red wool. The name Peter. I see a woman/young girl prancing playfully down the stairs with long flowing blonde hair. I see a gentleman standing off to the right side of the water, hands behind his back, black mustache. From this I get a feeling of happiness. People come from all over to this site, and to me it felt wonderful. This place is old, a more public place like a botanical garden type of location. A place to reflect. The Chalice wells is a very old sacred site. This photo only shows a small portion, the rest of the gardens are gorgeous. I feel sad. I see a man and a woman that used to meet here. I think this woman is from India. I see something tragic happening here to one of them many years ago. It feels like it’s a busy place now with people coming and going. The energy feels a little more upbeat but there is still sadness beneath. This is the lower portion of the well, there are several levels which symbolize raising your consciousness on the way to the top. This is where people release their emotions. It is a busy place now, lots of tourists and ceremonies. The first thing who came in my mind is that it looks like at the CHARTRES Cathedral,in France,the labirinth,which is drawn by the stones. Second image I had,a woman,the style could be Indian or Arabian,she’s sad. The third image is directly in the foto,Imean the little trees just behind the water its a face,the same with the water which is runing,the stone,they are Gods’s faces from old time…this is a sacred place,could have been kings who lived there..there isnt any gold fishes?why?like the Chinese one.the ones who bring luck.the 3 rings could be the Time…the 3 circles ..a part of the time is escaping,but you can go until God..the first circle is God,you cannt enter..its a wall,invisible wall,behind they are not happy about you.. This is a very sacred place. There have been many sacred rituals and shamanic journeys at this site. The symbol is called the Vesica Piscis and the exact translation is the bladder of the fish. The symbol is sometimes called “The Eye of God”. There have been many weddings and hand fastings at this site. I hear water trickling and I hear birds chirping. I see one or more benches to sit on around the outside. I see men walking around quietly with long robes who come here to gather their thoughts. I feel the serenity the scene brings to those who gather here. I was one of 15 people there, in long robes in ceremony. I am sure this has been recreated through time. There are numerous places here to meditate in the gardens. Lots of birds, mostly large ring-necked doves. The first thing that I felt was ‘weddings’ and then ‘zen’. I get a very serene feeling attached to this picture, but also anticipation and high emotion/joy. There is a place further up the hill where you can walk through the water, but that was the only place. We were asked not enter the water from this point. Definitely a place for wishes. I could smell lots of freshly fallen leaves. (although I don’t see any in the pic). I saw a bicycle. Also saw a large dog. Saw a flash of what looked like blue fabric. Reminded me of a blue canvas bag. Heard the word “plans”. I might interpret that as this area that the water feature is in either isn’t completed quite yet (something to be added to the area just out of camera range) or there is something someone has in mind for a potential use in the future for this area. The land is used for so many things, from concerts to rituals to weddings. There would be many “plans”. There was a bike rack out front with many bikes on it everyday. I can hear water trickling and birds around the water. Could see feet going down the stairs at a relaxed pace. I could also see men in robes knealing around the water bath. I got the feeling it is a sacred place. The ritual I participated in here consisted of our group, in robes, who walked down those stairs and then sitting or kneeling around the water. This image made my fingers all feel relaxed and tingly up to my hand knuckles. Also my feet feel bare and cool. The energy there was very strong. I saw a beautiful dark-haired naked young woman under a waterfall, who was laughing with joy at being bathed under the water. She was enjoying every single second of being in the water. I heard this woman laughing in joy and heard the waterfall rushing. I felt in my body how good the water felt coursing over it, and the sparkles of energy the water added to my body. I could feel the water bring relief and joy, as I could feel the healing in the water. I tasted iron minerals in the water, but I could also taste the healing in the water. I went out early one morning to find 7 naked woman bathing in the waters and they were all laughing. Our group drank from this well all week, there was a strong iron taste, but very healing water! I first feel like a sigh. A feeling of release. It is a beautiful pool/fountain/waterfall…logically waterscapes like this have always been used for contemplative purposes, and places to wash away sorrows/pain/illness….so I dont want to give that as my answer because thats the logical “me”. I see a woman washing her feet in the pool…washing others feet in the pool. It feels like a shrine of some sort or a place where hours and hours of contemplation occur, making it a shrine of sorts. The next level up is a place where you can wash your feet, definitely a healing bath. It is technically a shrine to the Divine Feminine. I got that this is somewhere in the West, maybe Oregon? There is female energy–I see a tall blonde woman in her mid forties or a little older. She dyes her hair and maybe has two sons and a husband. She could be a storekeeper, and this place used to be more special for her than it is now. Fairy energy was very strong there, definitely strong pagan connections. The symbol is called the vesica piscis. There is a retreat house up those stairs and there was a large library inside. The “Haire” or rabbit is considered sacred here. There is a long myth regarding the haire and why it is good luck. I feel as if it was on the property of where someone had lived once upon a time . I feel as if I saw a man n women walk down the steps together smiling n talking . It feels like the property has been taken over n made into a serenity garden . 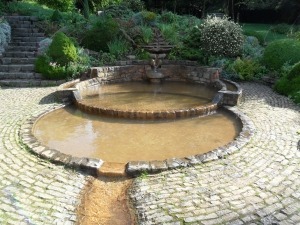 At first I see a laberynth in the coble stone around the fountain then I see the fountain as if it were a key hole . Then I see the fountain having two rings as if they are wedding rings joined . I feel people coming here to reflect . The care takers live on the property, they are a couple in their 60s. The well has been there for a long time, the retreat house is not as old. I am not sure if there was a house there before. Where are the answers to the exercises?? I feel the power of the water and the circles. I see ceremonial rites with chanting. This place symbolizes the eclipse of the sun by the moon. Weddings have taken place by this fountain, the unity of the water and the rings. The care taker told us of eclipse, solstice and equinox ceremonies here, and there are often weddings. The ritual I participated in here consisted of our group, in robes, who walked down those stairs and then sitting or kneeling around the water connecting with our ancestors. The care taker told us of eclipse, solstice and equinox ceremonies here, there are often weddings. Water makes me think of God. This appears to me to be a path to God. My first thought looking at the photo was “come drink”. I thought ritual. Felt a slight odd itch in the back of my throat. I see steps, but not the ones behind the fountain, I see the fountain as steps. I think Enter and grow, rise up. This a center, a focus. I feel warmth in the center from the sun. It could be cold in the grass or away from this place, but the sunlight and warmth you just bathe in around the water in the circle. I don’t want to go up the stairs. Baptism and cleansing. After reading others translations, I got a headache. Now that I’ve written mine, the headache feels released. Old. Those who constructed this were spiritual. Gatherings are social but rituals used to be done there long ago — Wicca perhaps since the energy seems feminine. Feel positive energy from the spring, light, and structure. I see a keeper an older spiritual female that may or may not now have a mate – perhaps a widow. Feels like this place is a business – spa maybe – but those who partake must pay. first I saw only 1 woman alone in a medatative state sitting like she was in a yoga position. I felt peacefull with overwhelming energy around me. Then I saw a wedding and celebration…sacred, holy. i feel that there are ceremonies- mostly religious and those in prayer here. Almost like a grotto. maybe some coins, maybe flowers put into the water- i sense feet walking in the water. Prayers to G-d for sure. Uplifting experiences, smiles, tears. A vacation or honeymoon somewhere in England. I got laughter, children running around beautifully dressed, this is a very old place, I see a lot of elegant rich people, this place is a part of something else bigger and elegant also… and why do I get ducks I have no idea. a holy place where people come to for the good energy, maybe the water there is healing? I feel that this must be a water fountain/pond at the very spiritual place. I feel a lot of people’s energies for hopes, wishes, etc…It is very calm and serene. I like the energy there. I feel like there is a New York connection to this property but this is not in New York ..it’s out of the country and the tie to this property, the owner has a small plane they personally fly or get flown around in their own aircraft. This creation was a disappointment in the fact that the one wanted it made had something else in mind but couldn’t articulate it to the builder. Some have thrown coin in, in fun and someone hears the “wishing well let’s toss a coin in” joke over and over with different visitors and doesn’t mind it. Something’s missing, something not being told. In a place that should be serene and beautiful, it feels empty. I felt as though I was in another country ~, gathering, wedding, white flowers, lots of people.I felt peaceful but too many people. Is this like a wishing well or where people say prayers? I see this as an old well where people gather for water and conversation. I saw a young man doubled over in pain. I felt a strong stomach pain. I immediately hear the water like the noise of a trickling creek and birds singing. I feel like I’ve dipped my hands into cool water as if to draw energy or cleanse my hands just by passing the water over them. I got an image of two female Idian women doing Yoga. A soft flow version. I smell Blood. I see a hidden place…this is only a portion of the whole. I see coins…feels symbolic…like the place is literally supported by coins. I feel much feminine energy and yet I feel like much strength and masculine attributes built it…although they feel “put down” or “subjected” to something. It is beautiful and sacred with a price. I see the wholeness in this picture: the circle as the opening and the circle as the closing. My first thought was singular but apart of a whole.Ritualistic.Misunderstood.Writings are important. water of life..the strength of something so delicate..it broke through the wall. I felt that the innermost fountain to be God/Source and the emanating circles to be human’s connection to Source while we’re incarnated on Earth. It is afternoon…wanting to get near the water and relax…listen to the mini waterfall as it trickles into the silky coolness of the small pond that is embraced by another small pond. I smell cedar or juniper and the lightness of flowers. I fall asleep in the sun. I feel like this is a courtyard of sorts. Maybe a private area, or an area that someone holds dear to their hearts due to something emotional that happened there. A very good meditation place, sounds of running water are very good for you. I see playing children. This picture makes me feel happy. I sense ancient wisdom and calm. The words out of sight and hidden. I am picking up the sense of cleansing and healing and birth/ babies. Lots of feminine energy and privacy. I simply feel at peace looking at this picture. It brings me to Buddhism, water flowing, the natural state of things as they are. I actually felt warmth on my shoulders, like I was there…basking. Looks absolutely peaceful and full of serenity but it is not. It helps (the current improvements and landscape) to quiet down the energy of the land put it feels like it was just like a pretty coat of frosting put right over a bad patch of land, land that had a history of trouble even way before the stone layers got to it. Young lady 9-14 in bluish dress standing on steps. Long brown dark hair. Face is hidden. She stays standing waiting on steps. Can’t leave. From another time. I feel war and death by American Indian tribes (indigenous) and later soldiers up to the late 1880s. Feel like an early church may be near by. I heard ancient. Perhaps the bricks are ancient. I heard that they energies are used for ancient rituals. I feel peaceful, spiritual. I see a woman in a white dress with a full skirt (like a hoop skirt) and a man in a dark suit playful squeezing or tickling her as they walk. Makes me think wedding, but that could just be my interpretation. I prefer it when you post the reality of what the photos are because it encourages me when I get something right and makes me trust my first impressions more. When all I have to go by is other peoples comments I tend to second guess myself. I feel the warm sunshine, I feel a peaceful place that has the smell of flowers, earth, tree. A place that is many years old, a place that you come to celebrate or relax, a place to tell your secrets in, a place to find yourself if you are stressed out. a place that is loved by lots of people. Family, a place for childrens laughter. A place for lovers old and young, a place to start a place to end life. I see overflowing, unclear, muddy, lush, warm,a memorial garden perhaps. Lots of people walking, animals too. I see ancient women carrying things on their heads. I see and hear a source of water, I see headstones. A rainy season, lots of activity. Toes, feet, yoga, meditaion, silence, water, a man wearing a buddist munk’s rode with his hands togehter and bowing. I feel that your husband asked you to marry him here. A place of paradox- both joy and sadness. JOY: events/parties bringing family together including a newborn’s baptism. SADNESS, a child drowned. People come here to remember and reflect. I see the image of a circle being drawn – Full Circle / Completion / The Circle of life. peaceful…I hear the soft sound of a waterfall. Steps leading up to a shaded area that is quiet and beautiful. I see old park like benches…a place to relax and think. Get away from it all. People come to cleanse themselves spiritually by sitting in the pool of water- removing negative energies. I feel the stones in this spot being really old. I can feel the warmth in the soles of the feet that have walked on them. The water is healing in some way. I feel hands, like they laying on of hands, again a healing energy. There is much female energy here. I can sense being surrounded by many women, or perhaps just one very sacred or powerful woman. Europe. Stone of earth. Circles of unendingness. Water of emotion. The water trickles and moves forward…spilling. Perhaps overflowing emotion. Pleasant day. From 15 th century perhaps…feel Italy or Greece. That’s what comes to mind. I see large house/mansion. many gardens. I see a woman in a long, flowing white dress, maybe a wedding? Antique feel – some time ago. I see a large dog – white with large black spots and long, silky fur. I hear the water trickling down and feel the sun. This is a garden and sacred space used mostly for meditation and centering one self. The energy here is high and almost electric and I can feel it opening my chakras. I feel calm, meditation, a special place to be alone w/thoughts, a feeling of contentment. I see & smell flowers, although none are pictured. Is this nearby your home, walking distance? Somewhere you visit regularly. I feel peace, cleansing tranquility… time to purify and renew our souls. New beginnings happening. I saw the connection of God/Soul/Spirit. Felt life and peace. Overall message is God meant life to be full of peace if a person truly seeks it inside! I sense it is old, not in the U.S. I see monks, meditation, special water. I see weddings, and visitors from all over. I felt a place of sacred healing. A place where people gather and share love with one another. it’s such a special place that I almost cried with joy when I saw the photo.